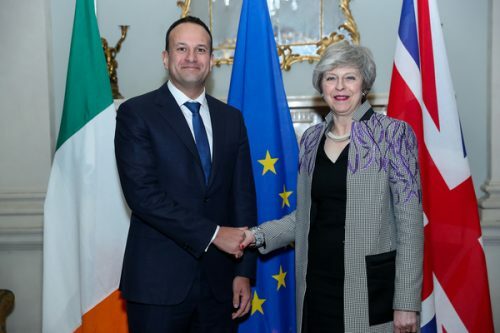 Leo Varadkar meets with Prime Minister of Theresa May in Farmleigh house last week. 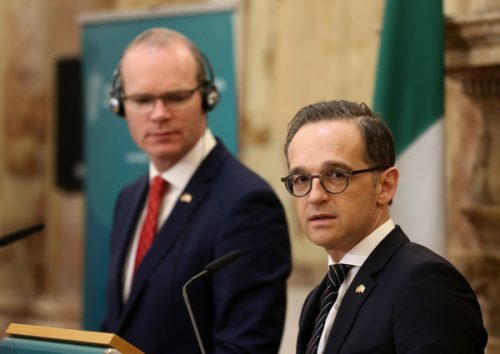 The Irish public is in overwhelming support of their government holding firm on the backstop even if it risks a no-deal Brexit, according to a recent poll. The backstop, an insurance policy to prevent a hard border in Ireland, has been the contentious issue causing the deadlock in British parliament. Certain Brexiteers – hard-line Tory MPs and the DUP MPs propping up the government – view the backstop unfavourably as a mechanism which keeps the UK tied indefinitely to EU rules. The EU and the Irish government have repeatedly said that the withdrawal agreement cannot be reopened. A Sky Data poll showed that the vast majority of the Irish public are supportive of their government’s approach to Brexit negotiations. Almost 80 per cent of Irish people think their government should hold out for a legal guarantee that there will be no hard border, even if it risks a disorderly divorce from the UK, the poll found. Just 7 per cent think the Irish government should be prioritising avoiding a no-deal Brexit. Inserting a unilateral exit mechanism or a time limit, which is what some British MPs want Prime Minister Theresa May to do, would render the backstop ineffective, critics argue. 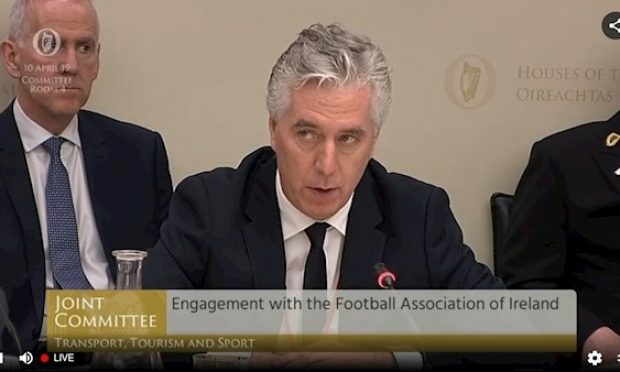 Ireland has also dismissed suggestions that it could be replaced with alternative arrangements, saying the insurance policy needs to be based on “legal certainty and not just wishful thinking”. Almost two-thirds of those polled think the Irish government has done a good job in Brexit negotiations, with just 17 per cent saying it has done a bad job. In contrast, the poll indicates, the UK government has played its hand poorly Brexit negotiations, with 84 per cent saying that the Tories have done a subpar job. 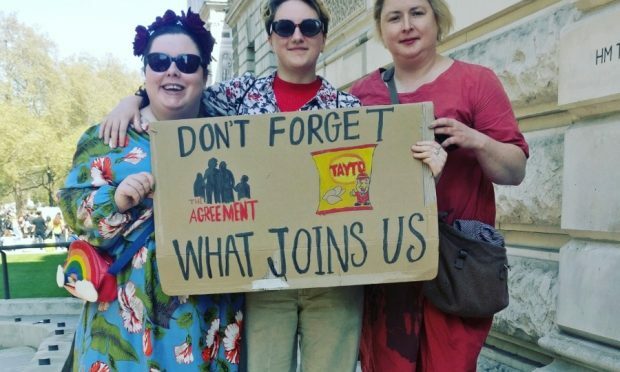 In the survey, it was also found that Irish people support a harder line to negotiations with only 7 per cent arguing that Leo Varadkar’s government should reach out for a compromise. Brexit also appears to have damaged Irish people’s views of the UK; 66 per cent say they have a less favourable view of the UK as a direct result of Brexit. Sky News asked over 1,000 of its customers in Ireland about how Brexit negotiations were going. Some 58 per cent think a no-deal Brexit would be “very bad” for the UK, compared with 36 per cent for Ireland. 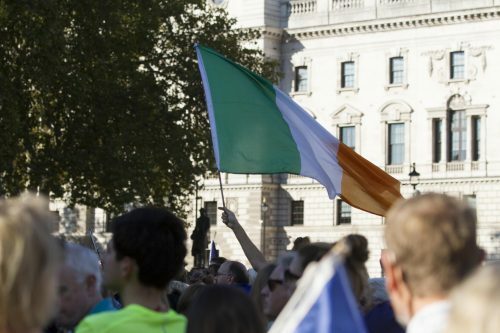 Irish flag being flown at a Brexit protest outside Westminster last month. If they had to choose, eight in 10 Irish people said they would cut economic ties with the UK rather than with the EU. 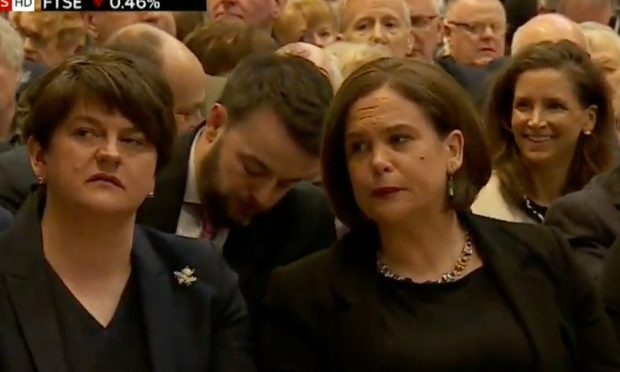 Brexit has also made people in the Irish Republic less favourable towards unionists in Northern Ireland in particular – 49 per cent now have a less favourable view of them as a result of Brexit. The DUP oppose the backstop so stringently because they fear it will weaken the constitutional integrity of the Union – as Northern Ireland would be treated differently to the rest of the UK by following different rules and regulations if the backstop was to come into effect. Meanwhile, the poll found that the majority of people in the Republic of Ireland would back Irish unity – 64 per cent support while just 16 per cent oppose. Sky Data interviewed a nationally representative sample of 1,611 Sky customers in the Republic of Ireland online from between the 1st and 4th February.